There's another quote that goes something like, "This new year, let's get down on our knees and thank God that we're still on our feet." I'm having surgery next week, so that one really hits close to home for me. We're still on our feet... still plodding along. I'm going to try to be better about setting and meeting goals in 2011. I have totally sucked at that this year. It's not really a New Year's resolution... more like a promise. Healthwise, this has been a tough year... or at least a tough end to my year, but I'm trying to focus on the many good things that have happened this year. I'm spending tonight with friends... and I wouldn't have it any other way. I love each and every one of them (Steve most of all, of course) and I feel so blessed to have all of these people in my life. It amazes me that none of these people were in my life a little over a year ago, and now they are some of the most important people to me in the world. I'm exhausted and should probably be in bed, but I'm excited to be celebrating with people who make me laugh and smile every day. Here's to 2011. All good things! Night time... Day Time! Night time... Day Time! 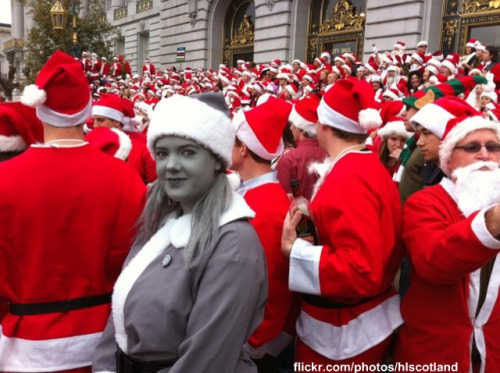 This Looks Shopped (But It Isn’t) of the Day: For the second year in a row (previously), Flickr user BrodyQat arrives at San Francisco’s SantaCon sporting her signature “Desaturated Santa” costume.